Document viewers for the iPhone and iPod touch have, in general, become increasingly sophisticated. With sophistication comes complexity, and iSilo’s approach, which assumes a fairly high level of user capability, is a valid one. You can do many things with iSilo, but only a few of them come easy. Folder View: iSilo offers a traditional folder/file hierarchy structure for storing documents. Offered by DC & Co., iSilo enables you to download and read documents in iSilo, Palm Doc, plain text, PDF, HTML, Word, Excel, and PowerPoint formats. You can place the files in folders, but moving them between folders does not seem possible—a real drawback if you like to stay organized. The app offers many options for document viewing—you can select a font, type size, and color. You also can choose among options for “tap” behavior—if you tap on the center of the screen once, you can have the document advance one line or a page, for example. iSilo also offers a slew of options for operating within documents, including bookmarking, sophisticated search, options to return to the first or last page of the document, or to resume where you left off. Unfortunately, iSilo isn’t very adept at handling common file types such as PDF or Word files. For example, it can not reformat PDF files for easy viewing (as GoodReader can), so you need to be prepared for lots of left-to-right scrolling. In my tests, the app imported an Excel file fairly well—except cell values were missing in one of the columns. You can move files from your Mac into iSilo by enabling Web sharing on your Mac, which sounds easy. But in practice, it’s a clunky solution that may require experimentation and a moderate learning curve for non-experts. In part, this is Apple’s fault, as it has disabled USB file-sharing functionality from the iPod. But it would be much nicer if you could upload files to an iSilo-hosted secure site, and then download them to your iPod. You can access files from services such as Dropbox; unfortunately, you can not download files from Google Docs (an option in GoodReader) You can, however, view Google Docs files and other Web-based files easily, as iSilo has a robust built-in Web browser. But you cannot edit the files, nor can you save for offline viewing. The most obvious drawback to using iSilo as an iPhone document viewer is simply that it is not designed for the iPhone. Its look-and-feel is dated, and its folder-based hierarchical file structure seems to be designed with desktops, not handhelds, in mind. The app’s developer makes no secret of the fact that iSilo is a multi-platform app—the home page boasts of versions for Android, BlackBerry, Palm, Pocket PC, Windows Mobile, Symbian, Windows and Mac computers, and other devices. In addition, iSilo’s Website— which provides comprehensive information both about the app and links to sites such as MemoWare and Fictionwise where you can download documents formatted for portable devices—is not designed for the iPhone. 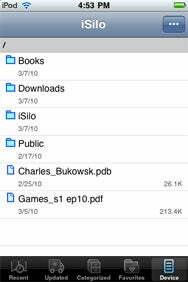 However, if you have a lot of Palm Doc files and are familiar with iSilo because you have used it on other portable platforms, the iPhone version could prove very useful. But as a general document viewer or e-book reader, this app falls short of the mark set by GoodReader, Stanza, and several other iPhone apps.